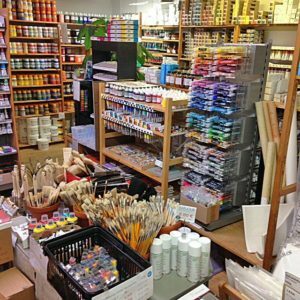 Painters can purchase art supplies from the Finnish Painters’ Union’s art material and supplies store. The selection of materials and supplies is wide and we also import and sell products that are not sold elsewhere due to a narrow market. It is also possible to order products by phone, email or an electronic form. Open: Mon 12–17, Tue-Thu 9.15–17, Fri 12–17. Closed on weekends.